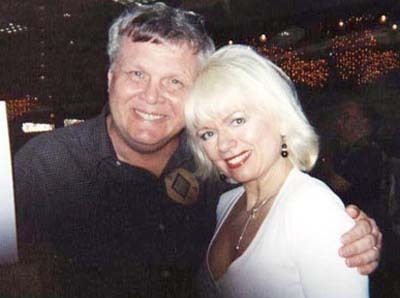 On one side was Charlene ("Dallas") Tilton. On the other was Jay ("Dennis the Menace") North. And there in the middle, a long way from Lincoln Park, sat Cyndi Targosz. The occasion was the Hollywood Collectors and Celebrities Show at Beverly Garland's Holiday Inn. Don Knotts was there, selling his autograph. So were Jennifer O'Neill, Jerry Vale, Buddy Hackett and Karen Black. Amid that august company, the woman who describes herself as "Jim Harper's very first traffic babe on WNIC" set up shop -- and people stood in line to meet her. "Believe it or not," says Targosz, who divides her time between L.A. and Downriver, "I actually get shy about this." The disbelief comes in because most of the people paying $10 to $20 for her signature a month ago knew her from a fitness video called "Best Bust." Others, meanwhile, had her sign copies of a new, '40s-pinup-style poster featuring Targosz in a blue-and-white swimsuit and an ankle bracelet. Neither item suggests excessive modesty, but they're just merchandise. To actually come face-to-face with people paying for the privilege was daunting, especially for someone in the middle of a career makeover. Targosz moved west in the 1980s to become a sitcom star and wound up a fitness guru. She also is or has been a voice-over actress, a leg model and a Betty Boop and Marilyn Monroe impersonator. Now she's focusing on her Web site -- www.starglowonline.com -- and on motivational speaking, lecturing everywhere from Veterans Affairs hospitals to cruise ships on the fine art of pummeling stress and poor morale with a blend of good cheer and good conditioning. "I'm always evolving and reinventing myself," Targosz says, and she's had a knack for staying ahead of the market. For the new millennium, she says, body shaping has given way to body image. "It's not just the way you look. It's about how you feel about yourself." Granted, it's probably easier to feel that way when you're trim enough to pose for a swimsuit poster. But Jay North seemed placid, too, she says -- and in the photos he signed, he was riding a trike and wearing overalls. Neal Rubin appears Sunday, Tuesday, Wednesday and Friday. Reach him at (313) 222-1874, nrubin@detnews.com, or 615 W. Lafayette, Detroit, MI 48226.
are not permitted without the written permission from principles at STARGLOW Productions, Inc.